Are you going to make a new thread on the new forums? Not too shabby so far. One thing I'd recommend is adjusting the Hbor and Vbor (in the "views" tab in the room editor) so the camera scrolls when Mario's in the center of the screen, instead of on the left or right side. Let's say, for example, the screen resolution is 480 x 270 pixels. Typically, the Hbor value should be half the room width (i.e. 240 in this case) and the Vbor value should be half the room height (i.e. 135). Also, nice choice of music, never thought I'd hear Toy Story 2 music in a Mario game. I like it so far! The visuals are my favorite thing about it, and the gameplay and level design is pretty solid too! One thing I noticed though, and it's something I notice in a lot of games that use this engine, is that the inclusion of the vegetables doesn't seem to really add much to the gameplay. It works in SMB2 because that's pretty much your only means of killing enemies, besides throwing them at each other, and in that game the placement of each veggie was thought out in accordance with the placement of each enemy, but here there are so many easier ways to take out an enemy that they seem like they're there just because they came with the engine and they can be there. 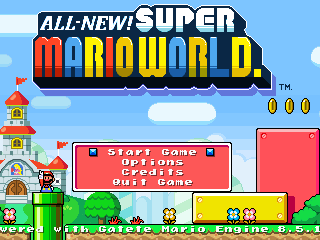 This is irrelevant to the game as its own thing, but I saw you say on the forums that you wanted this to be kind of like the NSMB for super mario world. From what I've played I'm not really feeling that. It could just be that the first level doesn't have them yet, but Super Mario World's main new features were the colored switches, the cape, and Yoshi. Maybe once those come in to play (if they are planned), it will feel more like a SMW remake, but right now there isn't really anything at all that connects this to SMW for me, not even the setting or storyline. Nice game, but can i play with the keys A and D? It's pretty, to be sure. A standard, by-the-numbers Hello engine game, but just from the artstyle I can tell you're putting a lot of effort into this game. Give it a little polish, find a way to set this game apart from the crowd, and you may have a winner here, Mr. Fly. Also, you may want to remove lives from this game entirely. A lot of modern Mario fangames do this, because it isn't fun when you run out and have to start from a previous area. Nah, I won't be doing that, it will makes things way too easy. That's why there will be in level checkpoints and save game points when you complete a level. Lives don't make a game HARDER, they make a game more PUNISHING. The difficulty remains exactly the same regardless of life count, except if it's infinite, then you dont have to WASTE time replaying the game for NO reason. It's an extremely antiquated design that very few people still even do, because it's just bad..
Great game thus far Superfly. The addition to custom controls is a definite plus, however the reserve button defaults to CTRL, even when you change it. I've also noticed that in the map screen, you can move upwards to a blank level (you can't enter it, however). Is that supposed to be a bonus-type area, or an error? When I selected the first level, I heard a warp pipe sound effect with it, yet it shows Mario on a blue panel. I was slightly confused, because that's normally the sound that plays when you enter a warp pipe, not when you enter the stage. The sound effect for collecting Star Coins uses the final Star Coin sound effect (the 1-up-like sound effect). Shouldn't it use at least two or three different sound effects for grabbing the Star Coins? Otherwise, I'm excited for the final product (or, at the very least, another demo). My review for this game is being queued at the moment. Good game right now, definitely has potential. Small advice - It's highly recommended you not use the word "New" in the title. New Super Mario Bros. is over a decade old, and it ain't new anymore. That's not really advice. This isn't NSMB, my fangame has nothing to do with it. That why it's called All-New! Super Mario World.